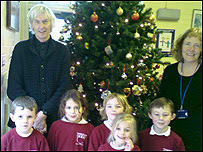 BBC Radio Suffolk came to interview staff and children in the build up to Christmas. You can listen to 3 interviews which BBC Suffolk used during their Christmas schedule. Link to Radio Suffolk site - scroll down their page to see feature on our school. The first interview is with Mrs Elphick (Headteacher) and Mr G. Owen (the chair of governors and local parish priest). The second interview was broadcast on Cristmas eve. The interviewer is talking to a group of Key Stage 1 children about their Nativity plays and about the meaning of Christmas: Tessa, Ronnie, Annie, Anna, Callum, Sam and Zac. The 3rd interview (with the children talking about what they do on Christmas day) was broadcast on BBC Radio Suffolk on 25th December.